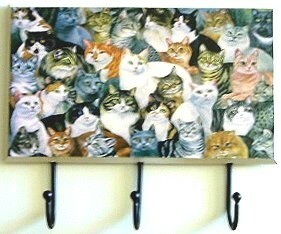 This cat plaque features the images of approximately 32 cats. This plaque is 9 3/4" wide x 8" high x 6/10" thick. Three are three sturdy metal hooks mounted on the back of the board. The hooks stick down 2 1/4" and the stick out 1 1/2". There are two holes on the back of the board for mounting.